Would you like to stock award winning goat's milk soaps, aromatherapy skincare and unique gift hampers in your shop? We're currently seeking suitable UK stockists. We only supply our handmade aromatherapy cosmetics to registered UK businesses who have bricks and mortar business premises. Sorry bit we do not supply to internet only businesses, so our stockists are usually gift and holistic shops, and qualified holistic therapists who stock our products for sale to their therapy clients. Sorry, we do not permit our products to be sold on web-shops such as E-bay or Amazon, via market stalls or at other temporary venues. Please note that we have a minimum order value for first orders. Trade orders are usually manufactured to order, so once an order has been agreed there will be a short wait while we prepare and package the order. 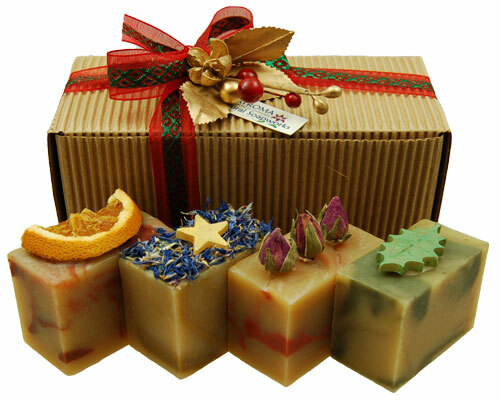 In this way, we can ensure that retail customers can enjoy the freshest possible natural soaps and skin care. We are always particularly busy as Christmas approaches, so please allow plenty of time to place orders for gift hampers and Christmas skincare. Interested? In the first instance, please fill in our wholesale form. Please supply as much information about your business as you can, mentioning the items you're interested in stocking. We'll reply to your message as soon as possible. Please mention which products you're interested in stocking. Where do you intend to retail our products? Please give a few details about your shop, if you have a website etc.